Today I want to talk about what is probably my least favorite of all of the anxiety symptoms out there, and that is intrusive thoughts. I try to find something to love about all of my anxiety issues, truly I do, but I gotta tell you, intrusive thoughts make it REALLY hard. For those who are fortunate enough to NOT know what intrusive thoughts are, they are unwanted, anxiety producing thoughts that seem to play on a loop over and over and over again in the mind of the person having them. They are like little worms that crawl in the mind, and they slither around, promoting a sense of fear and dread. They can feel impossible to get rid of…like those little burrs that used to get stuck on your clothes when you were a kid…. and they are usually a little “off” or strange. Quite often, intrusive thoughts are about something that the person experiencing them finds horrifying or gruesome, or goes against their religious or moral code. But really, these thoughts can be about anything under the sun. There is no limit as to what can become an intrusive thought and what can’t. Nothing is too mundane or “too crazy” or “out there” to make the cut of what constitutes an intrusive thought. If a thought bothers a person to a moderate/severe degree, if it is repetitive in nature, and if it feels like a thought that a giant spotlight in your brain is shining on, it can be considered an intrusive thought. In this series of posts, I will be focusing on the more bizarre and scary type of intrusive thoughts, as opposed to the milder intrusive thoughts that are considered anxiety provoking simply for their repetitive nature, rather than their content. To say that scary intrusive thoughts give the person experiencing them a sense of fear and dread is a major understatement. Anxiety disorders always have a way of making a person feel like they might be a little crazy. Intrusive thoughts take it to an entirely different level, especially when the intrusive thoughts are about something violent or horrific. They can make a person wonder if not only they are crazy, but if a full-blown psychopath is lying under the surface of their personalities just waiting to come busting out. My own anxiety timeline involves pretty much every anxiety symptom under the sun. You name it, I have had it. I would get one symptom under control, such as palpitations, but then because I hadn’t gotten the main source of my anxiety under control, a new symptom would pop up to replace the one I had just “fixed”. Intrusive thoughts were one of the later symptoms on my list. My first experiences with intrusive thoughts were pretty mild, all things considered. Thoughts along the lines of “What if I can never stop thinking this thought?” or “What if this feeling of anxiety never goes away?” They were basically just “What if?” thoughts about any old thing that would get stuck on a loop in my mind. It was always about some internal happening in my mind – never about anything in my “real” external world. These thoughts were annoying and unrelenting and they definitely produced anxiety but still, they were pretty tame all things considered. Once I got “used” to these types of thoughts and they never became anything other than mild annoyances, that is when I think my subconscious decided I was getting a little “too good” at dealing with anxiety symptoms and that it needed to start playing hard ball with me. My intrusive thoughts started becoming scary. My first round with intrusive thoughts was during my post partum period with my first daughter. Back on point here... my second round of intrusive thoughts all started on just a regular old day, during a typical time in my life when I had a lot of stress going on, I was getting very little sleep and doing nothing to take care of myself . I was putting the dishes away and the thought of me stabbing myself with a knife popped in my mind. It wasn’t an urge or a desire to harm myself. It was just a quick little flicker of a thought that popped into my head. The problem was that it popped in, but it didn’t pop back out. It stuck to my brain like one of those little dart board balls covered in velcro. I was SO upset about this thought….really freaked out…. and I wanted it out of my head as fast as possible. But no matter how hard I tried, I couldn’t get that thought to leave my mind. That thought..that fear… about me and the knife stuck in my head for weeks. It would pop into my head at random times and it would pop into my head every time I went near a knife. I was a bartender at the time, and when you are a bartender you have to cut a lot of lemons and every time I did, I was wondering if I might snap and go crazy and stab myself in front of all my customers. Not only did I have the thought ALL the time….every time I had it, I felt an overwhelming urge to over think it. I needed to analyze it and get to the bottom of it. I wanted to dissect it and put it under the microscope and find out WHY, WHY was I having this thought? I would tell myself “Just don’t think about it.” But it felt impossible not to. How could I just “ignore” the fact that I might be suicidal? I am just supposed to “let that go”? “Letting something go” is just not my nature. I felt like that would just make the thought grow larger until it took over completely. “No”, I thought, “I have to stay on top of this thought. I can’t ignore it because if I pretend it doesn’t exist, it might start controlling me instead of me controlling it”. So I kept at that thought, working it like a puzzle just looking for the answer to “what it meant” so that THEN, I could let it go and know for sure that I wasn’t crazy. It all seems so silly now that I am looking back on it with a clear mind. But at the time, it was all very threatening and dark and very heavy. I would analyze these thoughts and dissect them, trying to get to the root of them. We all know what happens when you scratch an itch too much. It makes it itch more and the thoughts and urge to analyze them kept coming more and more. The more they came, the more they terrified me and the more they terrified me, the more they came. It was a terrible cycle. It felt as though I literally could NOT stop thinking these thoughts. Of all the times during my anxiety disorder that I thought I was crazy, and there were MANY, this period of time topped the list. I was SO mentally exhausted. It was just an absolutely horrible time in my life. As so often happens with me and my anxiety symptoms, I eventually got to the point where I just had to tell somebody. As I said before, it’s a heavy burden carrying all of these fears and thoughts, and I always finally reach the point where I have to drop the load and let it all out and let whatever is going to happen, happen. I thought about making another appointment with the counselor I had seen one time previously with my post partum intrusive thoughts. She had done a lot in that one visit to make me feel like I wasn’t a lunatic with these types of thoughts. But those intrusive thoughts were post partum thoughts. Those were “normal” scary crazy thoughts, right? This time was different so she might not have such good news for me. Finally, I decided it didn’t matter because I couldn’t wait for an appointment and it all had to come out RIGHT NOW. As usual, I broke down in a sobbing heap and told my husband. I was in the car on the way home from getting my hair cut, I will never forget, and I was telling my husband about all of this stuff going on in my head. Now, my husband is not the kind of guy to get phased by anything…..certainly not by anything going on in my head. He knows me better than anybody and is well aware of the places my nervous imagination will take me. The map spans far and wide, let me tell you. I was explaining to him all about these intrusive thoughts and how they were different from the irrational fears and thoughts I had before, post partum, because of their intensity and extreme repetitive nature. I was crying and sobbing and oh, it just felt so good to get all that out. It always does…….I don’t know why I hold stuff in as long as I do. I think its a pride thing. Then again, it could just as easily be a “This time they might REALLY cart me away” thing. And that moment right there was probably one of my top three anxiety related life changing moments….ever. Something happened in my brain that was so profound. Something clicked in my head and I “got it”. It’s all just brain junk. Intrusive thoughts are just debris…..debris flying around our brain. It is all just random nonsense that doesn’t mean anything. It is meaningless. It is nothing. Its junk. My husband looked at me like he NOW thought I had lost my mind. From the moment I had that epiphany in the car with my husband, my fears and beliefs about my intrusive thoughts dramatically lessened. Never once did I ever take them as seriously again. I am not saying the thoughts completely went away. It’s not quite that simple. But they went from being a huge ugly demon looming over me, to a growling dog. It became manageable fear that didn’t take over my life. My power was back and it wasn’t long before I figured out how to deal with those ugly little thought worms and forget all about them. The truth is that every step forward in my anxiety recovery has been when I found another little piece of my power. If you never have an “epiphany” about your intrusive thoughts, that is okay. That is, of course, what I strive for with my blog. I want to give every reader that “Aha!” moment that flips a switch for them. But I know we aren’t all wired that way and even if you never have that same revelation about “Brain Junk” as I did, just take this post as a little puzzle piece and tuck it in the back of your brain somewhere. Who knows – maybe someday you will realize that your subconscious put it into place without you even realizing it. That is how I managed to get control of a lot of my anxiety symptoms. Okay enough for now. Click here for Part 2, where I get to what is at the root of these scary intrusive thoughts. No worries – you can handle this. Hiya, so you have an email address at all I could contact you on? Would really, really appreciate it. Hi Anna Lisa well I thought I had spent long enough researching online over the years to have read every thing about anxiety but just found your blog last night and wow! I was googling scary intrusive thoughts. Your blog was me to a tee, even showed my husband the bit where you said ‘ but this is different this time, it’s worse than before’ as this is me every time! It is such a relief to know these awful thoughts are just another anxiety symptom. And I know they are there now as I was over coming lots of symptoms, feeling like I was no the road to recovery, so my brain threw a curve ball at me. That is ALL this is right?! It’s the first time someone has actually described me to a tee with all this. I am going to read the rest of your blog now. Yes, that is all this is. 😉 Best wishes to you, you are going to get through this. Keep reading whatever you can get your hands on until there is nothing left to learn. And then read a little bit more. Hi AnnaLisa, im in my teens. Ive been dealing with anxiety for a few months now and last night i had this scary image of hurting myself. I know i would never do that but it scared me so much. Could this be OCD? I’ve only had this one image come into my head though. Please let me know im worried!! Well, this is just my unprofessional opinion and I certainly don’t want to suggest that I know better than your therapist, but during my own experience with anxiety, I have found that I have to separate it from all of my family members. I spent some significant time looking for “understanding” and “compassion” and I wanted people to know how hard it was for me and not think this was all in my head. I wanted kindness and support and my feelings were constantly being hurt because I felt like people didn’t get me or that they cared. Now I know that was a complete waste of my time. Those who don’t have anxiety disorders will never understand what people who have anxiety disorders are going through. They just can’t get it. And especially if they have been living with somebody who has had it for a long time, chances are they are going to get inpatient and rude at times and be exasperated. I am not saying it is right and I am not necessarily excusing that behavior….but it makes sense that it would be that way. Before my anxiety disorder erupted, I worked at a doctor’s office and I used to roll my eyes to myself when people would come in with “anxiety”. I am not proud of it but I did. I thought it was all in their head and they needed to toughen up and quit looking for attention. That doesn’t make me a bad person, it just means that I had an idea in my head of what it was, and without having gone through it myself, that perception would have continued. I actually wrote a post about this not too long ago. Click here. In it I talk about how my husband’s seeming lack of interest in my anxiety disorder has been the greatest thing he ever did for me. I didn’t know it at the time but his lack of understanding and his lack of any real compassion and the fact that he just wanted me to act like the “normal” person I was was the greatest gift he has ever given me. Even if it was unintentional. I am not saying your husband shouldn’t be an ear for you if you need one. Of course he should. I am not saying he shouldn’t support you. Of course he should. But you have to let go of “needing” that kind of support and understanding. If you get it great…but if you don’t….you will be just fine. Anxiety is a disorder that one must ultimately walk alone in order to get through it. We walked ourselves into this disorder with our negative thinking and compulsive worry and lack of taking care of our emotional health….not that it was our fault…..but now we have to walk ourselves out and relying too much on how others respond to our disorder can hold us back. You have to NOT need his opinion to matter. You have to not concern yourself with how you are affecting his mood. You have to learn to be self reliant, independent and focus on YOUR journey that he can’t go on with you. He can’t walk with you and hold your hand the whole way. He can be the guy on the sidelines holding the cup of water for you….and he should be ….but if he is not…you will find a water fountain somewhere. I think it would be a great idea if you could go to the therapist with him and explain to him what exactly he can do to help you help yourself and how to be that guy holding the water cup for you. This is all such a mystery to him and men are often so practical and logic based that maybe if he had it explained to him “Here – this is exactly what I need you to do for me to help me become stronger.” Then that would help him and help you too. Should you HAVE to spell it out for him? No. Believe me I know that story, but the second thing you have to realize is that men are not living life looking through the same lens we are. They think and process differently and when it comes to our emotions…sometimes they need to have an instruction sheet just as if they were putting together a crib. I know that may sound harsh and if you don’t agree with me that is your call and I wouldn’t tell you that you were wrong because everybody’s journey is different. But that is the attitude I had to develop and it took me a lot of years to come to this on my own but it has been the best, most wonderful thing in the world to no longer NEED my husband or his support. It is nice on those times that I get it but for the most part I walked this anxiety recovery journey all on my own and nothing in the world could ever make me more proud of myself than that. It was what my brain wanted from me…to prove that I could handle myself BY myself. Once I did that..it calmed down and the anxiety went away. As far as meds go, I did not take anti anxiety meds. There are a few schools of thought on anxiety. One is that it is a problem with your brain. One is that it is a problem with your thinking. And one is that its just who you are and you can’t do anything about it so you can live with it or sedate yourself. I don’t recommend taking medication unless A) you want to sedate yourself or B) You really believe and your doctor agrees that something could definitely be wrong with your brain chemistry. I have always believed that my anxiety is within my own control and that I just need to develop better thinking habits and take better care of myself and that has served me well. You have to decide what YOU most believe about your own anxiety. Educate yourself- read everything you can on the subject – talk to your therapist and your doctor and form YOUR own conclusion. You are a smart person, otherwise you wouldn’t have an anxiety disorder. Trust your instincts and what you have learned and decide how you best want to treat it. If you ever decide to stop taking the meds, I would def talk to your doctor about the best way to discontinue them because sometimes abruptly stopping can have negative side effects! Yes, but that was very helpful!!! Yes def full blown anxiety. 🙂 You sound exactly like I used to sound. I mean, to a tee. No- anxiety is definitely not mental illness! It’s actually a sign that your brain is working just as it is supposed to. You just have to change the orders you are giving the crew, so to speak. Ask me questions anytime! Great article! Thanks a bunch. @Konrad Dobson, thank you for stopping by. The intrusive thoughts were the worst part for me. I can’t tell you how relieved I was when my therapist gave me a book where stories were shared by people with OCD/Anxiety. 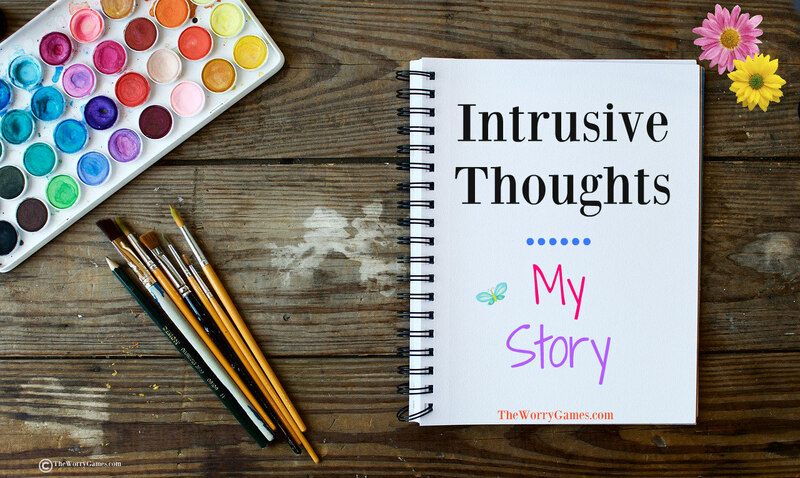 To read about their intrusive thoughts….it changed everything for me. I’m not saying I don’t still have them from time to time, but knowing that this was happening to other people gave me some sense of peace. I don’t think anything has freaked me out as much as this did. You’re right, it’s the talking and sharing and informing yourself that sets us free. Had I kept that inside instead of talking to my therapist about it, I may have never known. It does make you feel so amazing when you hear that other people think those thoughts too, doesn’t it? Great idea on your therapist’s part to have you read that book!